Italian officials say the government has threatened to block foreign boats from delivering African migrants to its ports, declaring the situation to be “unsustainable”. “We can’t go on like this,” a source told AFP after media reports that Maurizio Massari, Italy’s ambassador to the European Union (EU), handed a letter to the bloc warning the country was considering closing its doors to boats of migrants. 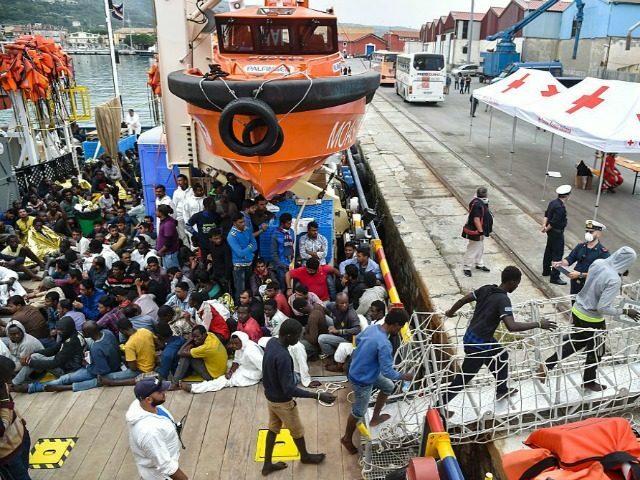 “The ambassador highlighted that Italy’s efforts have been enormous and well beyond international obligations, and under the current circumstances it is difficult for our authorities to allow further disembarkations of migrants,” an Italian diplomat quoted by German news agency DPA of the meeting with EU migration Commissioner Dimitri Avramopoulos. Prime Minister Paolo Gentiloni said Italy “cannot go on like this”, and accused other EU nations of “looking the other way”. The threat comes after local elections at the weekend saw the ruling, globalist Democratic Party (PD) suffer heavy losses at the ballot box to the centre-right Forza Italia and the anti-mass migration Northern League party. More than 10,000 Africans were ferried from Libya to Italy between Sunday and Tuesday — with 5,000 arriving on Monday alone — and whilst the Italian coastguard coordinates the operations, a large number of the ships taking part are NGOs sailing under foreign flags. A number of these organisations have been accused by Italian authorities of “colluding” with criminal people-smugglers to bring migrants to Europe. Prosecutor Carmelo Zuccaro reported that phone calls were being made from Libya to NGO vessels offshore to help smugglers complete the final leg of the journey in a billion-dollar European smuggling operation. Several of the NGOs have financial ties to globalist billionaire George Soros, who has openly admitted his goal is to bring down Europe’s borders. The Hungarian financier’s Open Society Foundations has provided funding to Médicins Sans Frontiéres (MSF) and Save the Children, whilst the Migrant Offshore Aid Station (MOAS) receives major support from Avaaz.org, the European branch of the Soros-founded organisation Moveon.org. Why Won’t The Panama Papers Lefty Leakers Expose EU or American Establishment Figures? Democrats Russia Hacked Us and Failed Recount Campaign is Political Suicide. The US Democratic Party’s inability to accept that they lost the Presidency to Donald Trump is turning into a slow polictical sucicide. The party that has always been quick to scream ‘conspiracy theorist’ to discredit critics of its dealings with oversreas governments and foreign billionaires like Soros has revealed in its efforts to overturn the result by claimING that Russian hacking influenced voters in favour of Trump. What’s going on in American political life now is beyond belief, I mean this is not some third world banana republic we are talking about, and yet some billionaire is trying to destabilise the rule of law and that cucksocker in The White House is doing nothing about it.